With another 15 Future Shocks since the last Summary and 2000AD having passed its one-year anniversary here are some thoughts, stats and considerations. Peter Knight has been the most prolific contributor to the first 25 Future Shocks with lettering duties on 17 stories. Lalia, despite not appearing after FS 8, is still the most prolific artist with 3 appearances although he is joined by Brett Ewin’s at the top of the appearance count for artists. Artists with 2 Future Shocks by this juncture include Trevor Goring, John Cooper, Jose Luis Ferrer, Ron Turner and Kevin O’Neil. Notable amongst the debutantes of FS 11-25 are Brian Bolland and Brendan McCarthy. Bolland was beginning to feature regularly as a Dredd artist whereas McCarthy, although doubtless contributing to work of Ewins and his brother Jim, would have to wait longer to become a regular art droid. Shocks continue to be written by a diverse group – Robert Flynn leads the way with five, Steve Moore, the author of the initial Future Shock, has four to his name and Martin Lock has written three. Chris Lowder is notable for having written two ‘comedy’ Future Shocks and also for being lucky in having the talents of Carlos Ezquerra and Brian Bolland draw them. None of the ‘next generation’ of writers that 2000AD would become famous for fostering has yet appeared although a future Tharg, Richard Burton, has turned in a moderately successful Shock, his sole writing credit in 2000AD. Despite FS 25 being a one and a half page gag the general trend of FS 11-25 is of longer stories and less ‘final panel reveals’. As a consequence several of them, notably many of the more successful, tend to read as Terror Tales rather than as Shocks. Chris Lowder’s scripts are more Comedy Shocks and none the less entertaining for it. The majority of Future Shocks are accompanied by an intro from Tharg but several are not. The best flesh out the character of the main protagonist despite the restrictive page count – Arthur Upshot’s loneliness as a low-earth orbit scrap merchant, Jed Orville’s brutish hipster thug desperate to get off the planet and the under-pressure Mayor Croxely who defeats the insectoid invasion. Certainly Upshot and Orville have enough character in their brief appearances for their stories to be taken further, a true sign of a well written tale. In a slightly different manner two Shocks are notable for placing the reader in the place of the protagonist, the stressed out astronaut in Solo Flip and the frustrated boy in The Guardian. Both these stories stand the test of time well, not only due to their art but also due to this narrative technique. By Prog 54, where the 25th Future Shock appeared, 2000AD had been published for just over a year. It’s market was still decidedly teen and pre-teen boys and its main stories were still the sort of strip now largely and unfairly overlooked in retelling of its history. Prog 54 itself featured Judge Dredd, in Elvis the Killer Car from the middle of his Luna-1 sojourn, the ever-constant Dan Dare, MACH 1, who likewise had appeared in the majority of issues, and Colony Earth, a great 10 part War of The Worlds type action adventure. Rounded out by a very kid-orientated Walter The Wobot one-pager, it is clear that 2000AD, Luna-1 slight craziness aside, hasn’t strayed from its initial concept as a Boys-Own in space. The Future Shocks are well in keeping with this remit and The Guardian deserves special praise for how in-tune it is with those likely to be reading week-in-week-out. The audience does appear to be lovers of gore and frightening images as several Shocks are quite visceral in their contents, rats eat living people, charred corpses sit smouldering in cars and small children await their doom as mutants lurk in darkness with their eyes shining forth. FS 24, On the Run, hides one panel as ‘too disturbing to show’ but that can only have been for the story’s protagonist as the readers were well used to far more disturbing than the aftermath of a hit-and-run accident. FS 15 (Prog 42): Time Past – Martin Lock institutes a grand Future Shock tradition of the hapless hero doomed by his own ineptitude. Plot: It is 1987 and the Apollo Moon Landings are continuing apace. The Astronauts venture out alone on their flying surfboards detailed to complete their scientific tasks. Mission leader Jack Keller is astounded to see a non-crew astronaut but each time he approaches the mysterious astronaut disappears only to reappear further away. Finally Keller catches up with the strangely faced astronaut but quickly finds himself strangled unconscious. Shock: Keller comes to in an underground med-bay. It is revealed to him that the aliens can mimic his appearance and he is already replaced on the flight to earth by one of their kind. Without a space suit he is free to roam only within the facility where he is astounded to discover other Apollo astronauts from past flights, including, Neil Armstrong. Thoughts: After the visceral success of Killer Car Robert Flynn reverts to type with a Future Shock that simply doesn’t add up. The hover-boards and chase scene is quite well done, getting to the gist of the action quickly and placing our hero in a desperate situation however the shock simply makes no sense These are aliens that can teleport, change shape at will, build underground bunkers that lie hidden from decades of Moon landings however they need to hitch lifts to earth? For such a technologically advanced race that has got to rank as the lamest invasion strategy ever seen. Maybe their goal is to subtly influence earth’s children by a series of motivational speeches in high schools and commit a bit of adultery when apt; the normal life for returning astronauts. 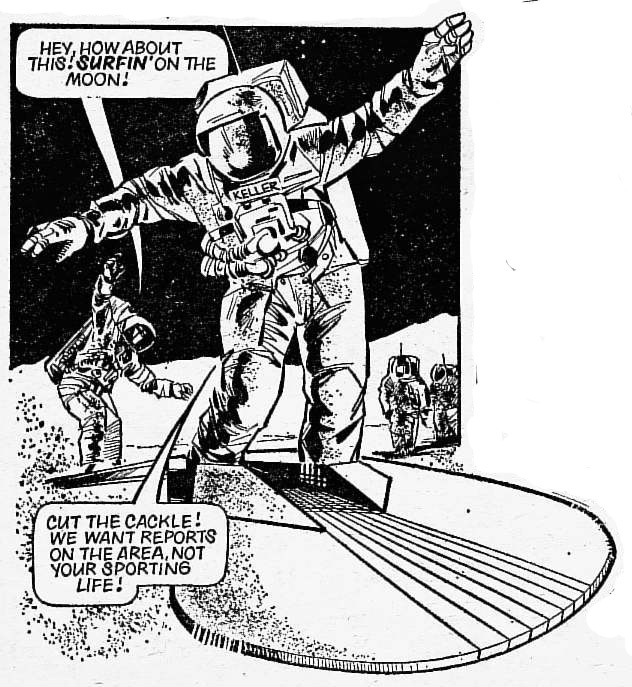 That obvious incongruity aside the strip also posits as its ‘shock’ that Neil Armstrong returned as one of the aliens. Except it doesn’t in the slightest look like Neil Armstrong; nor even look like a 58-year-old man, the age Armstrong would be in the storyline. The lack of shock is added to by the smiley faced nature of Armstrong, and the fact he is still wearing his full Apollo spacesuit 19 years after he landed on the moon. Giorgi’s art, his only 2000AD appearance, is technically accomplished but seriously marred by this terrible ill-thought out tacked-on ending and failure to get a photo-reference for Armstrong. Shock’d? At the laughable Neil Armstrong panel most certainly. There isn’t really a shock, the aliens replacing humans on the trip back to earth is more of a narrative component than the shocking conclusion. 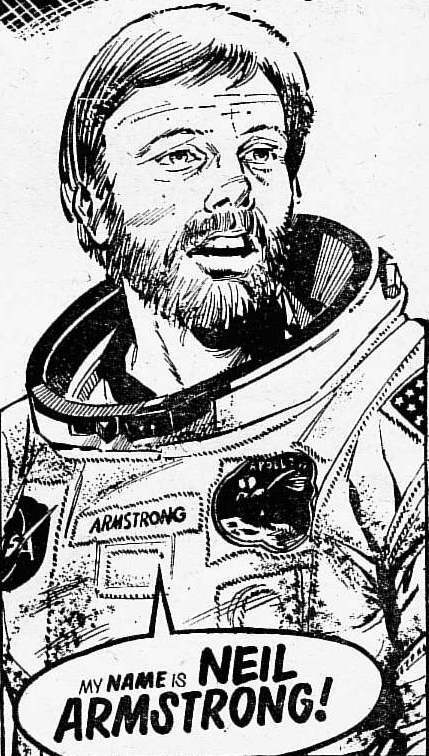 The reveal about Armstrong, who in the late 70s would still be a significant celebrity to children interested in Sci-Fi, is undermined by the actual drawing.